ManChoi Chow's passion for life inspires his photography, nurtures the artist within, and connects spirits in a shared vision. Ultimately for him, this interconnectedness awakens the presence of the transcendent and evokes greater life possibilities. Having engaged in the caring and healing of the human spirit for most of his life, he is currently more passionate than ever to discover the transforming connections between photography, art, spirituality and healing. 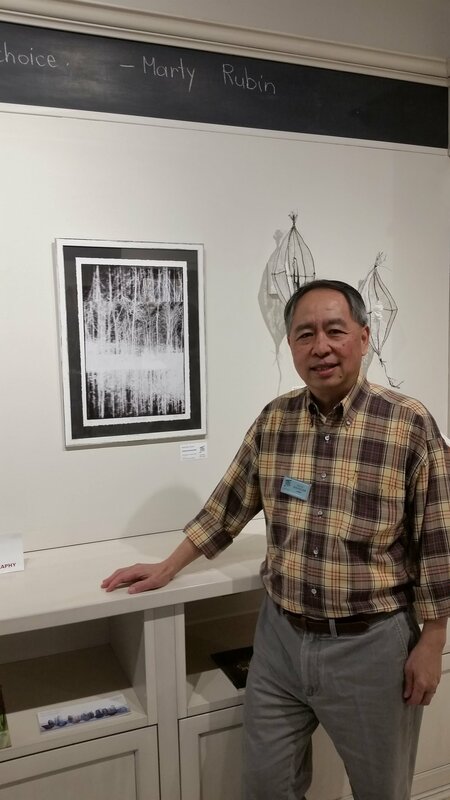 He is a member of UpTown Gallery in Waterloo and in 2016 was voted Favourite Local Artist in the Waterloo Region Record Reader Awards. 1. How did you get to where you are as an artist? I certainly never thought of myself as a professional artist until maybe five years ago or so, but I've been doing photography since I was about 10 years old. My Dad gave me a camera, likely a Kodak brownie. I guess I really took to it right from the start. I do remember when I was about 12 or 13, my Dad bought myself and my younger brother very good cameras. I retired in 2015. I was a spiritual care professional, a hospital Chaplain at St. Mary's as well as St. Joseph's in Hamilton and a few other places. They are the health institutions affiliated with the Sisters of St. Joseph Hamilton Diocese. I was the Director of Spiritual Care for about 20 years. Prior to that I was seven years on staff at Freeport Hospital when it was still Freeport. Before that I was a Catholic Priest for 10 years. When I was anticipating retirement I thought I would get back into my photography in a serious way. I started showing in local galleries. Gallery M in Cambridge was my first major show. At the same time, I had been showing at The Art Store (The People's Gallery). I still exhibit there. I also had one other show at the Crawford Collective in Brantford. After the show at Gallery M, and getting positive feedback at The Art Store I thought that maybe it would be worthwhile trying to get into this "full-time". I applied to the Uptown Gallery Waterloo in 2015 and was accepted. I don't know if there is a typical day per se though the time I spend at gallery is typical. The membership takes turns hosting at Uptown Gallery, about two to three, three and a half hour shifts roughly each month. When we are hosting the gallery we are responsible for all the retail aspects of the gallery, including selling and cleaning. I also train Chaplains, therapists, and counselors. I have maintained my credentials as a spiritual care professional as well as a psychotherapist. I still practice part time in those areas. I'm part of the Delton Glebe Counselling Centre which is affiliated with Waterloo Lutheran Seminary at Laurier University. It's a training ground for students who are going through to be therapists and Chaplains or other spiritual care and pastoral professionals. The rest of the time, I work on my art. I have a studio at home. My wife is very understanding and very tolerant so that is really helpful. Most of the house has become a gallery. Just about anything. I like landscapes. One of my other hobbies is gardening and landscaping. A lot of my art work has to do with landscapes. I've just recently become aware how much I really like trees. There's something about trees that capture my attention and imagination. In part, I suppose because they are so majestic, so complex, so essential for life on the planet. They are so unique and diverse and full of personality. I try to find inspiration wherever I am. I pay attention to what's around me and the situation that I'm in. It ties in to my previous life and my other profession. A lot of what I've been taught and also I train others to do is to be fully alive wherever we are, to be in the moment. This is very difficult to do and takes a lot of practice. My wife is also my inspiration. She is very artistic and a wonderful decorator. I look for inspiration in ordinary things and scenes that’s part of everyday life. I want to express my vision of life around me, and to discover a depth that I would otherwise miss if I wasn’t paying attention with an artistic eye, especially through the lens. 4. How did you get involved with the Uptown Gallery? I knew that I had something to offer artistically, but I know myself well enough to know that if I tried to do this on my own it would be a disaster. I was hoping I could join talented and more experienced artists for encouragement as well as learning how to get into the profession. The marketing and selling part of it can be overwhelming. What really attracted me to Uptown Gallery Waterloo, besides seeing the magnificent work of some of the artist members, is the fact that it is a collective, a co-op. That was really appealing, especially as I got to know more about the history. I value the vision of the gallery, enunciated by its founder and a few local artists gathered by her. The Gallery was started in 2005 and was first called Art Bites. Podi Lawrence was the Artist in Residence in Waterloo in the early 2000's. In 2005, she gathered a number of artists and started Art Bites. It evolved and Podi followed other artistic and personal pursuits outside Canada. The others kept it going, thankfully. I believe this speaks well of the original vision and that it was the first artist co-op in this area. I like that I'm not working for a company, the artists are all working together, focused on making and selling good art. The collaborative aspect is really appealing to me. Last year I was invited to be one of the Executive Chairs and I feel honoured. The co-op has come a long way from the days of five or six artists. We try to maintain a membership of 20-25 artists. As we see galleries closing all the time, for this gallery to be in our 11th year is really an accomplishment. Consensus building is important. We encourage as many voices as we can to speak up and also to assume responsibility for running the gallery. We're an unregistered not for profit gallery. The original artists saw this as community service in a loose sense. They wanted to educate and pass on what they knew. No doubt they wanted to make sales, but it wasn't only about the sales. Those values still percolate through the membership today. There are 65 members that have come through the gallery over the past 13 years, and several of the founding members are still currently active. I think we have something precious and I hope we can continue to grow that. 5. What's been the highlight of your artistic career so far? My artistic career is certainly very young. My very first show, my exhibition at Gallery M was an important part of the journey. Being accepted into Uptown Gallery was really important. As I've been one of the featured artists at the gallery three times now I value getting the acknowledgement and the feedback and people saying that my work was special and meaningful for them. Last year, as part of the inaugural Belmont Village Bestival (kudos to Tim Moher, local musician who worked tirelessly to launch this European styled neighbourhood festival of art, music and cuisine) my art was featured at the Kitchener Framing and Art Centre, who does all my framing. I actually used to work for them many years ago and I have stayed friends with Kris (owner) and Anne Marie. They graciously sponsored a solo show to coincide with Bestival. Basically the whole gallery was my art, about 40 pieces. They were going to keep it up only for about three weeks but ended up keeping it up for much longer. It was greatly beneficial for both of us. That was definitely a huge highlight. 6. On the Uptown Gallery website, you said that you see the art of photography as a focused way of living. Can you explain that? My art has really taken me to a deeper, more profound level of understanding of how to be in the moment fully and to really pay attention to what's around me. Even when I'm driving, I try to pay attention to the landscape around me, the changing light, how the trees change through the seasons. I don't think, “let me just get through this and get to my destination”. Integrating spirituality, art and photography has been an ongoing project for me since becoming a professional photographer and artist. I'm still working on how all this comes together, but I try to communicate those types of themes in my art. I'm always amazed what a small world it is, there are so many connections. I believe making connections and making meaning in life is what spirituality is all about. 7. What is your dream project? Is there anywhere you'd like to go and photograph a specific thing? That's a great question. I really don't have one per se. I suppose that's the flip side of being as totally as present as I can. The phrase that is coming to me is "mystical landscapes". I want to create a space through my art where you really transcend, where the beauty of the space really takes you somewhere else. I know that is kind of ironic, given what I was just saying. I guess what I want my art to do is to allow someone to enter into it so that they can be fully alive, fully human, being in touch with all the complexities of living, full of ironies, paradoxes, with light and darkness, hopes and disappointments, joys and sorrows, to find meaning, purpose and fulfillment. 8. Do you have any advice for aspiring artists or creatives? Go for it! Really, just do it. If I hesitated and held back, I wouldn't be where I am now. I feel very fulfilled and very good about what I'm doing and what I'm hoping to continue to move into. It's not just a job. It's something that nourishes me. Believe in yourself. 9. What's next for you? There's an artist call coming up with Art$Pay "Distillation - The Essence of Waterloo". I just signed up and became a member. I like shooting locally, where I live, where I am. I like the concept of that show. I don't have any huge or specific goals. I just want to keep going. I feel good about what I've accomplished so far. The possibilities are infinite. I want to keep learning, keep growing, keep getting exposed to different kinds of collaboration. If you'd like to see what ManChoi is up to next, visit his website, or follow him on Facebook and Twitter.